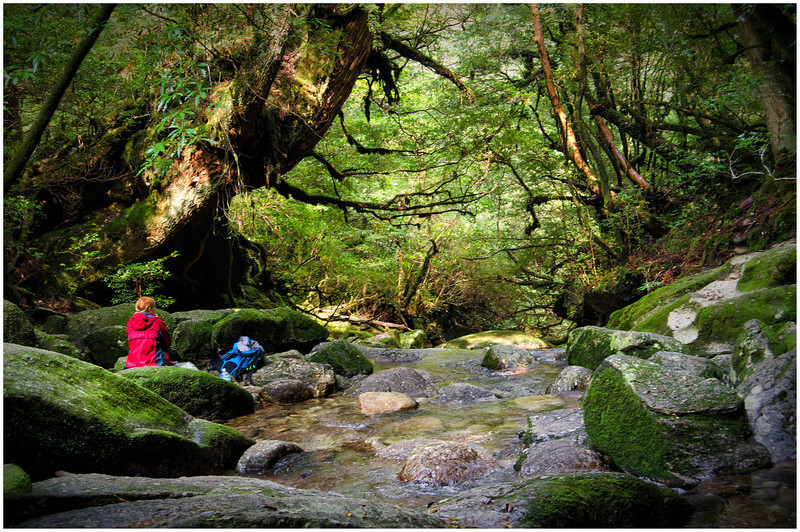 For information on how to get to Yakushima, please drop by my Japan travel planner. 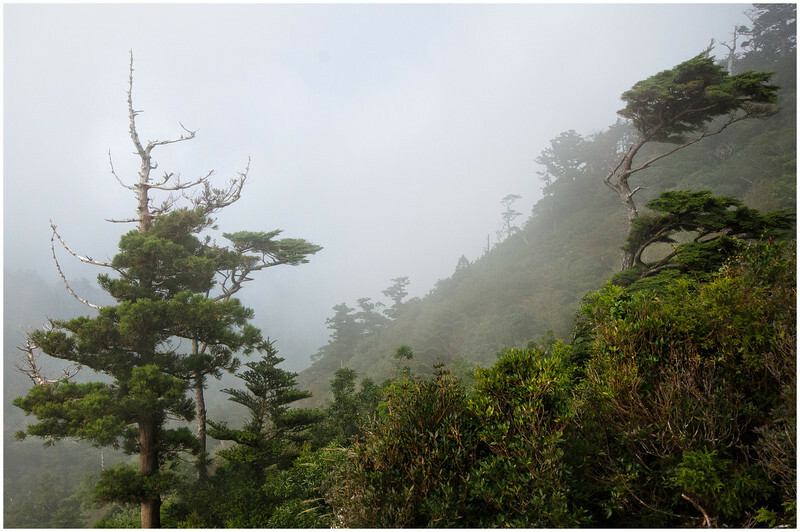 We were based in Onaida (Shiki-no-yado minshuku), a small village on the south coast of Yakushima only a short drive from the port city of Anbo. 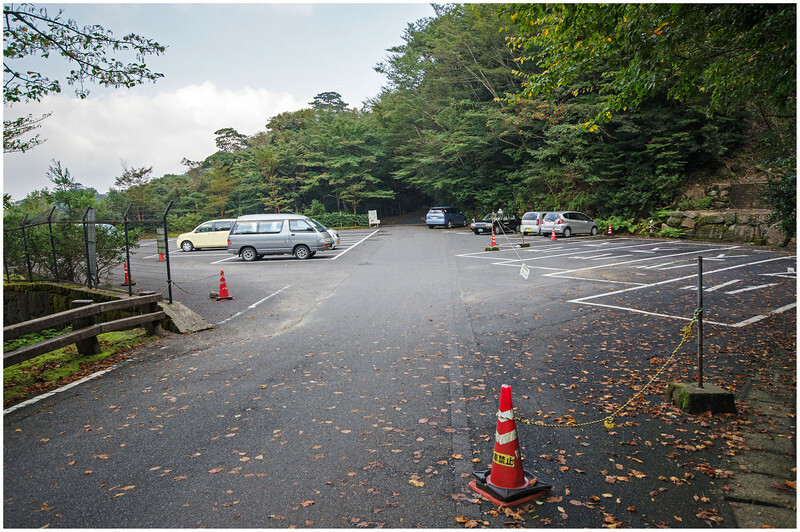 Knowing full well that the bus service on Yakushima was infrequent and slow, we had picked up a rental car for the time we spent on the island. This proved invaluable in getting us to the trail heads of both the Shiratani Unsuikyo and Yakusugiland hiking trails. 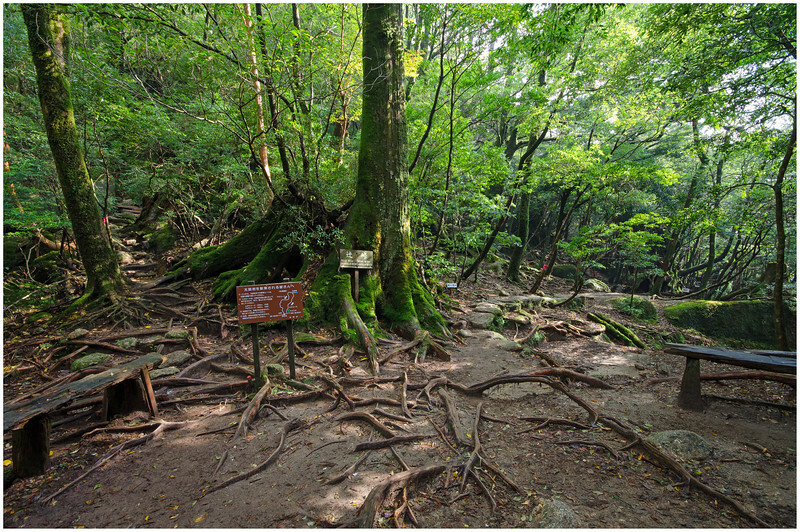 This Shiratani Unsuikyo Guide Map provides some further detail regarding access and directions, and also provides a good map of the Shiratani Unsuikyo hiking trail itself. 1. The starting point for this hike is quite obvious, only a short walk from the carpark with numerous signs and a manned hut at the entrance (donation entry if I recall correctly). 2. 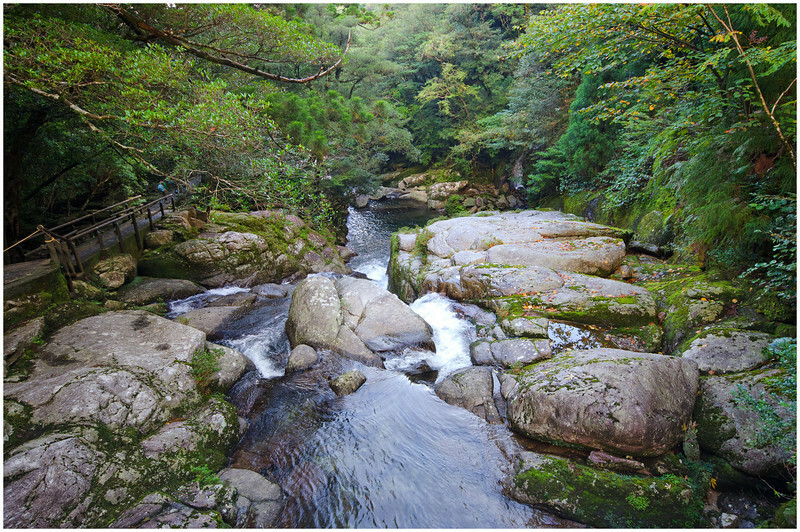 Follow the sealed path along the right hand side of the river until you reach the turn off to the Yayoisugi Cedar (marked on the map in red as the Yayoi Hiking Trail). If you don’t have time for the Yayoi hiking trail then you can skip this by continuing up the river for another 500m to the Satsuki-tsurihashi suspension bridge. 3. 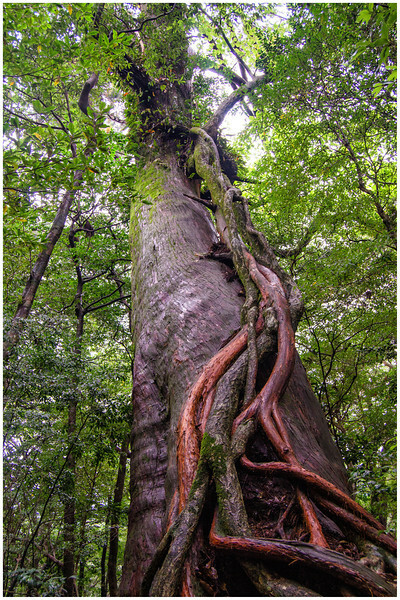 The Yayoi hiking trail takes you on a 30 minute loop walk through the lush cedar forest, stopping by the massive Yayoi-sugi about half way in. If this was the only walk you did at Shiratani Unsuikyo you would leave a very happy person! But you have to trust me when I say that this is nothing compared to what was to come! 4. 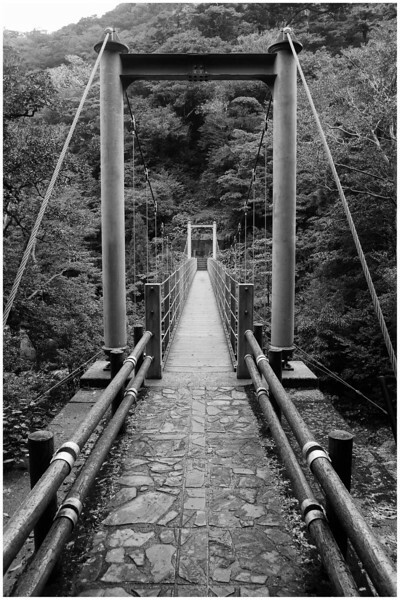 The Yayoi hiking trail loops back and rejoins the main trail just prior to the Satsuki-tsurihashi suspension bridge. 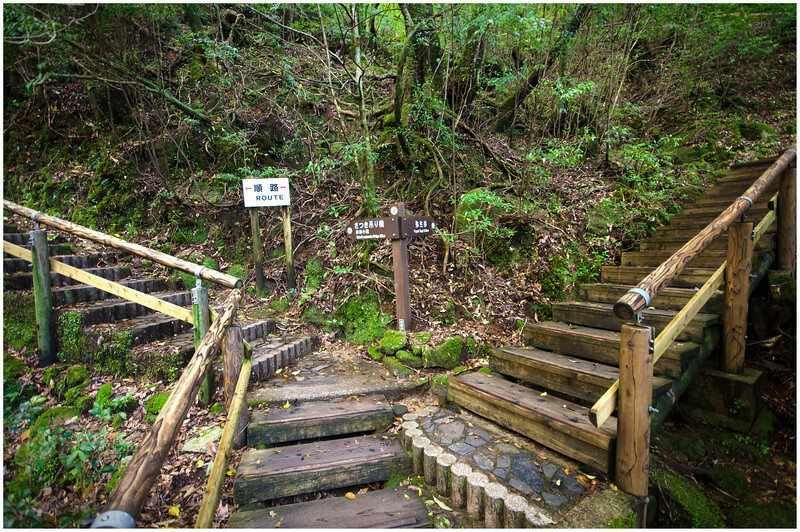 At this point you can either take the Kusogawa trail over the bridge to the left and walk directly to the Shiratani Cabin, Tsujitoge Pass and Taiko-iwa Rock, or you can take the longer (and in my opinion far more rewarding!) Genseirin trail to the right. 5. What can I say about the Genseirin hiking trail that will do it justice? Words honestly aren’t enough to describe the feeling you get as you walk beneath the towering green cedars. 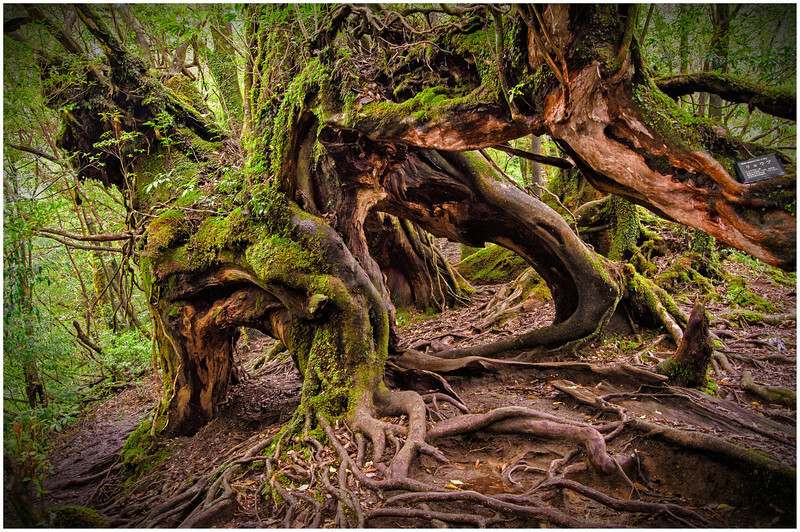 Verdant moss draped over every surface, moisture dripping from branches, capricious swirling mists teasing you with glimpses of the dark forest depths. Occasional beams of sunlight, lancing through the canopy and illuminating the rich red trunks of the massive trees that surround you. 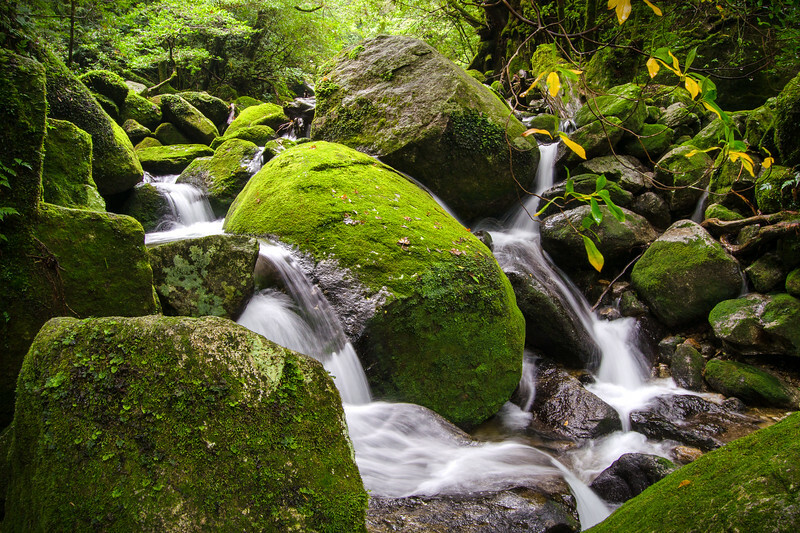 The trickle of the numerous tiny streams carving their way down the mountainside, or the gush of a waterfall roaring between hard granite boulders. Simply stunning. 6. After about 2 hours we arrived at the Shiratani Cabin. While the toilets were welcome, the accompanying aromas certainly weren’t! I’m sure if you decided to camp the night here you would get used to it fairly quickly, but the conditions were pretty basic. If you were strapped for time you could turn back at this point and make your way back to the car park, but we were keen to do the full walk up the valley to Taiko-iwa Rock. There were heaps of these little guys along the numerous trails. Totally harmless yet quite bizarre! 7. The trail continues on up the valley for the next half an hour, passing through more of the incredible forests. 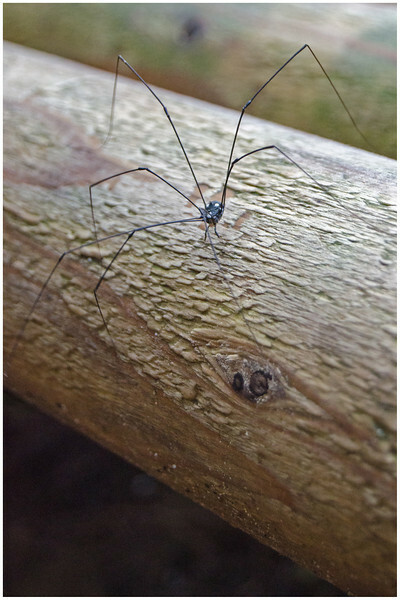 These ones in particular are alleged to have been the inspiration for Hayao Miyazaki’s ‘Princess Mononoke‘ anime film. 8. 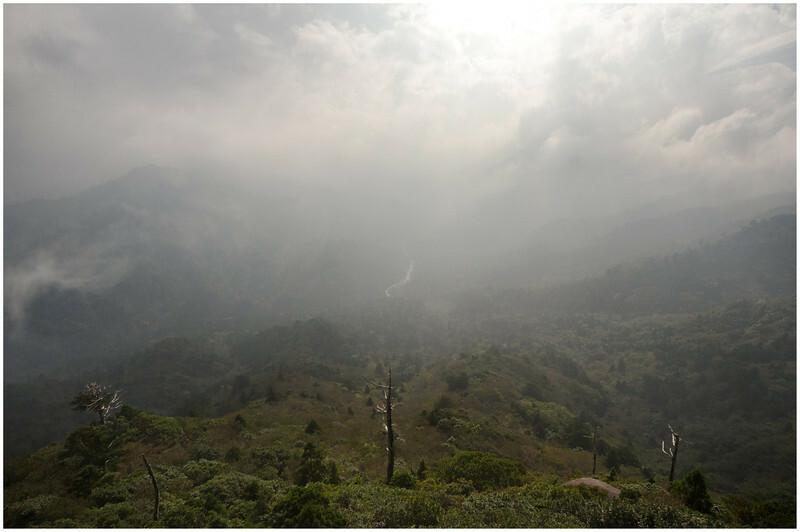 We eventually arrived at the Tsujitoge Pass, at the saddle in the mountain range. A good place to catch your breath and have a bite to eat before tackling the final climb. The path to Taiko-iwa Rock is a loop commencing from the right hand side of the sign in the photo below (near the pink flag). The path returns to the left hand side of the sign and it’s clear that they would prefer that people do the loop in an anti-clockwise direction. The terrain is such that it’s also physically easier to do it this way. 8. The climb from Tsujitoge Pass is pretty steep! 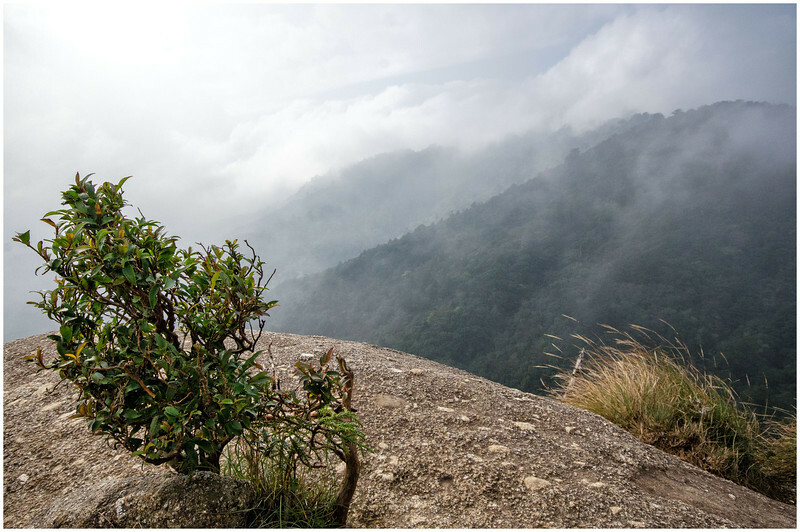 Using ropes, roots and a lot of scrambling, after about 15-20 minutes of hot and sweaty climbing you’ll reach Taiko-iwa Rock. Stunning views greet you to the north, looking across the valley on the other side of the range. 9. After a breath-taking rest at the top, we made our way back down to the pass, past the cabin, and alongside the river on the opposite side to that which we followed earlier in the day. The final reaches of the river were quite beautiful in their own right, with the lively stream dancing over the boulders and gushing down long narrow chutes carved into the rock over the ages. Again, words fail to describe the incredible experience that is Shiratani Unsuikyo. This place has changed me for the better, and it won’t ever be forgotten. Regarding practicalities, the hike took us around 5 hours in total, obviously including many stops for photos! If you were fit and quick you could easily do it in 4 hours, but honestly, why would you? The level of fitness required for this hike isn’t high. 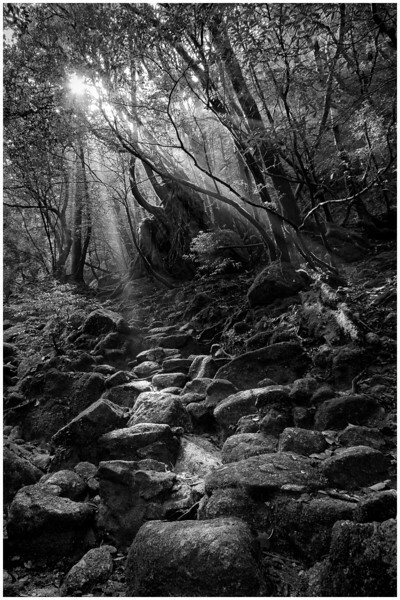 While the final climb up to Taiko-iwa Rock should only be attempted by those with a very good level of fitness, all the other sections of the hike could be completed quite easily by anyone with a low to moderate level of fitness, as the path generally follows the contours of the mountains, as opposed to climbing steeply. To anyone considering a visit to Japan, put this at the top of your list!! If you’re interested, there’s some more info on the hike in the travel blog that I wrote while staying in Japan. Great blog! We are travelling to Japan next month and I really want to do this hike. We will have our 4 month old baby with us though. We are experienced hikers but this will be the first time with the little one. I’m pretty much sold on doing the hike but I’m worried that the scrambling up to Taiko-iwa Rock will be too much. Do you think that final climb would be a bad idea with the baby in a carrier? Hi Justin, thanks for dropping by! It’s been a while now so the trail may have been upgraded, but from memory I’d say that it’s probably doable, with a lot of care. But rather than go charging off and finding yourself in a spot of bother – I recommend that one of you and your baby wait at the tree where the loop starts, while the other scouts the loop to see what you think. The loop isn’t long, so it shouldn’t take too much time to duck in, check it out, and then make the call. Thanks for sharing detailed info regarding your hike! I’ve been looking for more detailed hiking information prior to our trip and you guys nailed it. Thanks again! Glad we could help Olivia! Three years on and it’s still up there as one of the best walks we’ve ever done. I’m sure you won’t be disappointed!